If you've ever had problems with losing tension in your rope while tying a knot, or wasted time untying a difficult knot, here's your hassle-free solution. 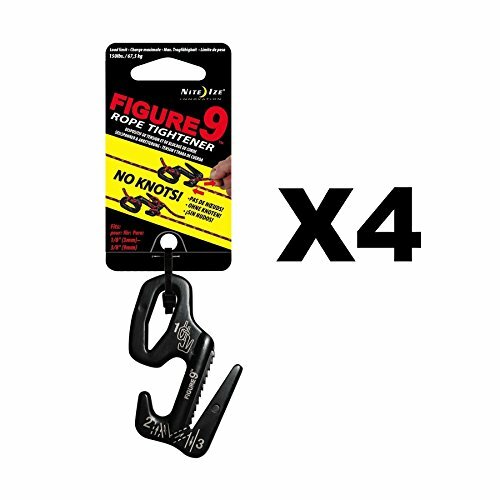 Our innovative, patented Figure 9 tightens, tensions, and secures ropes without knots.The Nite Ize Figure 9 makes tightening any line a stress-free task. From tying awkward objects to the back of a truck or vehicle to organizing tools or items in the garage, this handy tool secures large loads quickly and keeps tension where you need it. Loop your rope through its strategically designed prongs, pull it tight, and it stays that way. A smart alternative to complicated cam tensioning devices and bungee cords, our Figure 9 also controls the release of high tension, avoiding sudden and dangerous unloading.